A Sentinel, Okla., man on Thursday shot the town’s police chief four times and was then released from custody after questioning. All lives matter and I’m glad no one was killed in this bit of 2nd Amendment insanity — but if after Martin and Brown and Rice and Crawford you still somehow wondered if white privilege were a thing, just give it up. Sentinel Police Chief Louis Ross was shot in the chest three times and once in the arm Thursday morning after breaking down the front door and entering a house at 205 S 4, Sentinel Mayor Sam Dlugonski said. The chief was wearing a bulletproof vest that was loaned to him by a sheriff’s deputy minutes before the raid on the home. He survived the shooting, and authorities said the vest saved his life. Dlugonski and a neighbor on S 4 both said the man detained in the shooting was Dallas Horton, who lives at 205 S 4. Investigating authorities did not release the man’s name. Agents with the Oklahoma State Bureau of Investigation said the man who shot the chief was released after hours of questioning when they determined they didn’t have enough evidence to arrest him. “Facts surrounding the case lead agents to believe the man was unaware it was officers who made entry,” OSBI wrote in a news release. Chief Ross said Washita County 911 received two calls from a man who identified himself as Dallas Horton, and claimed to have a bomb inside the head start school…. Chief Ross told News 9 he called for county back up before entering Horton’s home. Up to this point, Horton claimed he never knew any officers were in his home. “Don’t know what he heard or didn’t hear screaming from five officers of the law announcing our presence, requesting to see hands,” said Chief Ross. I’m going to go way out on a limb here and state (a) it’s amazing, just flat out gobsmacking, that anyone could shot a cop four times and not face a gazillion bullets coming the other way; and (b) that I simply cannot imagine the circumstances in which a non-white cop-shooter who did survive the initial event would be back on the street the same day. Again, I want to repeat something really important: it’s a great thing that neither the police chief nor the suspect are dead. That’s what we would want to see come out of moments of crisis in law enforcement. I’m just noting here that I want that outcome for all those confronting the sudden presence of armed cops: toy wielding shoppers, kids on a playground, young men walking, anyone. Such happy endings shouldn’t be reserved only for a gun nut who can be distinguished from those less fortunate individuals by — among other things I’m sure — the fact that he happens to be white. 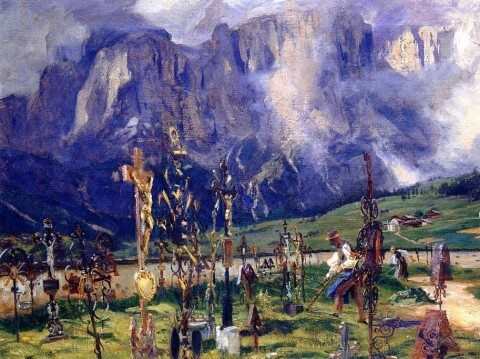 Image: John Singer Sargent, Graveyard in the Tyrol, 1914-1915. “We don’t have time for this,” Wilsey recalled one of the officers saying before he fired in between the two officers who were holding the teen down. The Boiling Spring Laes Police Chief has cleared his officers of any wrong doing at the scene. Chief Brad Shirley says an internal review shows his officers did not break any laws. the family said that they were not invited to attend….Outside the press conference, the family held signs, demanding justice for Keith Vidal. It is early days, of course, and the lawyer for the cop suspended after the incident says his client will be seen to be innocent, which is the presumption until a jury says otherwise. All the usual disclaimers apply. But on the facts established so far (like this one: “The first unit on scene reported a confrontation in the hallway, but told Brunswick County Dispatchers several times that everything was OK.”), this looks very bad indeed. And even if there are mitigating circumstances that come to light, still, this is what happens when guns are the first tool you reach for instead of the last. That’s the deep problem with American gun (nut) culture. There are just too many guns out there, available to anyone “responsible” or not. The reality, of course, is that there are lots of situations where guns are inappropriate and lots of people for whom guns are just a really bad idea. Some of those people are cops. I hugged my son extra hard when I got home last night, I can tell you. 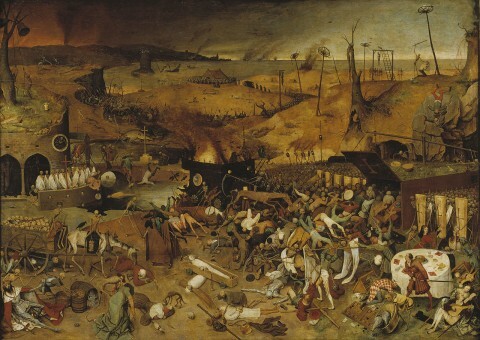 Image: Pieter Breughel the Elder, The Triumph of Death, c. 1562.